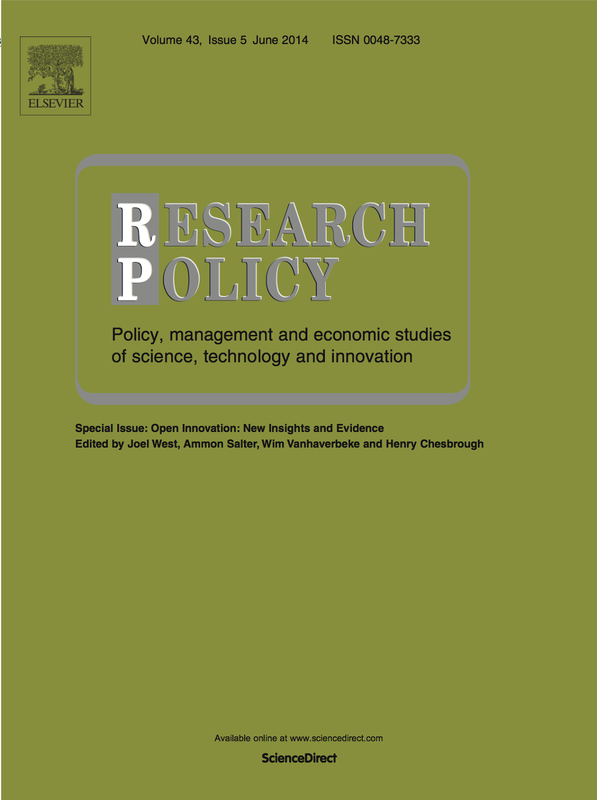 The Research Policy special issue “Open Innovation: New Insights and Evidence” is now online with the final pagination. The June 2014 issue also publishes the new editorial board announced in April. Thanks again to all who made this special issue possible. 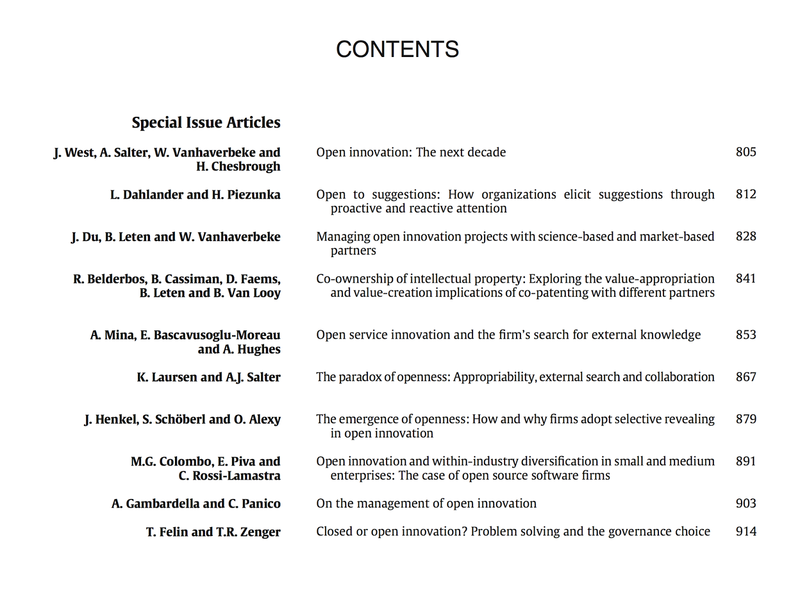 Research Policy today announced that the last article of our special issue — “Open Innovation: New Insights and Evidence” — has been published online. All 10 articles (see below) are online at the Research Policy website, and will be in print in the June 2014 as Volume 43, Number 5. In editing the special issue, we sought to shape how the field thinks about open innovation. We have a diverse body of research designs, that reflects the nature of the field today. (I will say more about the content of the special issue in a future posting). Henry Chesbrough first suggested the special issue in September 2011, to mark the 10th anniversary of the publication of his original book, Open Innovation: The New Imperative for Creating and Profiting from Technology. In October, we confirmed the four guest editors — Henry Chesbrough, Ammon Salter, Wim Vanhaverbeke and Joel West. Also in October, I spoke with two of the (then 10) editors of Research Policy to understand the process of approving and running a special issue, and from this we submitted our proposal to RP in December. The RP editors approved our proposal in March 2012, and then the call for papers went out immediately. We had conference papers submitted in April, a conference at Imperial College London in June, and then the official manuscripts were submitted in September 2012. I don’t know much about the broader debate on the quality of special issue articles, but these papers went through a process every bit as rigorous as any other paper for a top journal like RP. Even if editors liked a paper, in the end we couldn’t publish the paper unless it satisfied the reviewers and met all the standards of the journal. While there are two peer-reviewed articles by the editors in the special issue, four were rejected: all six were handled subject to Research Policy’s conflict of interest policies. The special issue took longer than we expected. At the beginning, the RP approval process took an extra three months because we didn’t realize that RP only considered such proposals twice a year. During the process, we underestimated how long reviewers would take (even with quick turnaround, 60 days is best case), how many rounds we’d need (most papers required three rounds) and various other delays that came along the way (such as when reviewers turned us down). The first paper was accepted in June 2013 and the 9th paper in December 2013. Finally, the editors (particularly me) contributed their own delays that probably added another 2-3 months to the process. Editing a book (with an overlapping set of contributors) certainly didn’t help. Thus, our 10th anniversary special issue — unlike Henry’s 20th anniversary issue for Teece (1986) — is coming out about six months later than we had originally hoped. We want to thank the Research Policy editors — particularly Ben Martin who led the approval and particularly Ashish Arora who saw everyone of the manuscripts — for their encouragement, support and patience in this process. We want to thank the many reviewers — top innovation scholars who remain anonymous — for their thoughtful and timely feedback on the submissions. We hope that the articles will be an important milestone in the careers of these authors, and that innovation researchers will find these articles useful in how they think about open innovation going forward.